Hi everyone! Hope you all started your week on a good note. My weekend was spent preparing for my trip to Costa Rica. I have spent a day and half in Costa Rica and all I can say is that it is a beautiful place. A well needed rest and relaxation for hubby and I. On the other hand, peplum tops have been making a big impact in my wardrobe. Its cinched waist and classic appeal draws me closer like a kid tasty for more. I can't stop accumulating peplum tops. Adding to the classic touch is the Zara wide leg pants -- a touch of color without loosing its' elegance and simplicity. The length elongates my legs...love it! 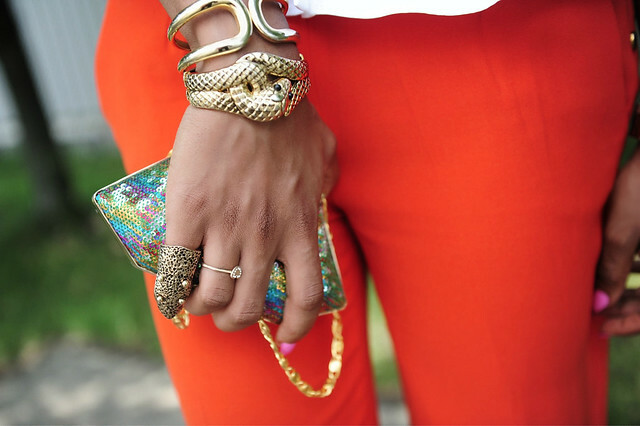 Beautiful pants and I love the layering of the bracelets. I'm in love with those orange pants. They're have the perfect cut! You look stunning as usual. Happy anniversary !!! I cannot wait to see your pics from Costa Rica. 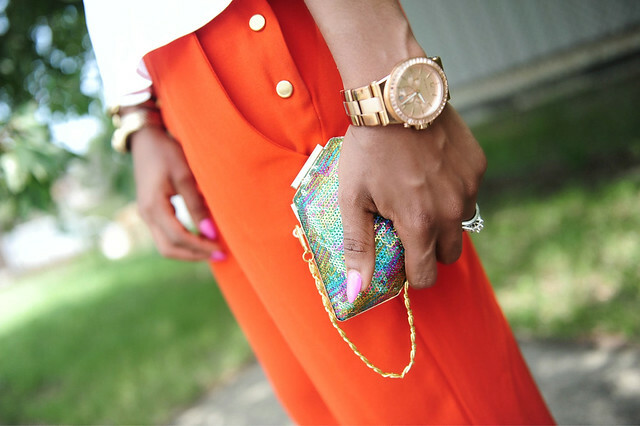 peplum top and multi sequin clutch. i love the bracelets and the details on the pants. I'm in love with your clutch ! u look so trendy and classy, love it. Happy anniversary to u and your hubby. Ooooooh! Enjoy your time off! Costa rica sounds amazing. I loooooove your orange trousers! Fab Fab Fab pants!! great color!! and as always, beautiful pics. The shot of u and the hubby's shoes are my fav! Loveeee it! 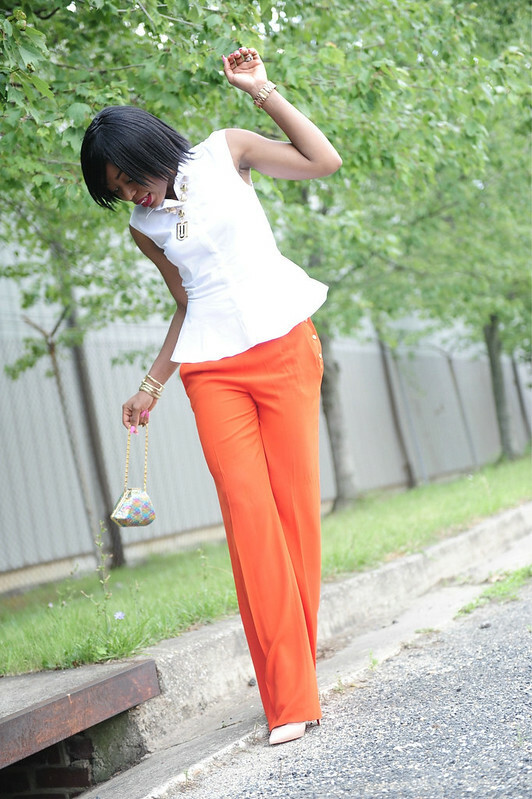 I was on the search for the perfect peplum top and I just got myself one..love how you paired his with the orange wide-legged pants!..gorge! I really like the last photo. Simple but yet says so much. The ASOS purse is too fabulous. Wow. Awesome, totally awesome. 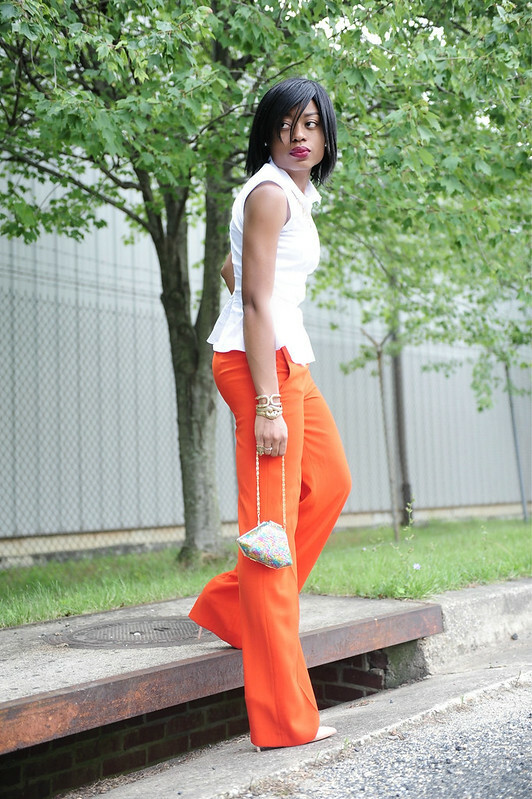 The orange pants are wonderful and complement the new season approaching! Stunning as always! Love the pants. So pretty. I hope you enjoy your trip and relaxation time. You are always dressed so nicely. I love it! 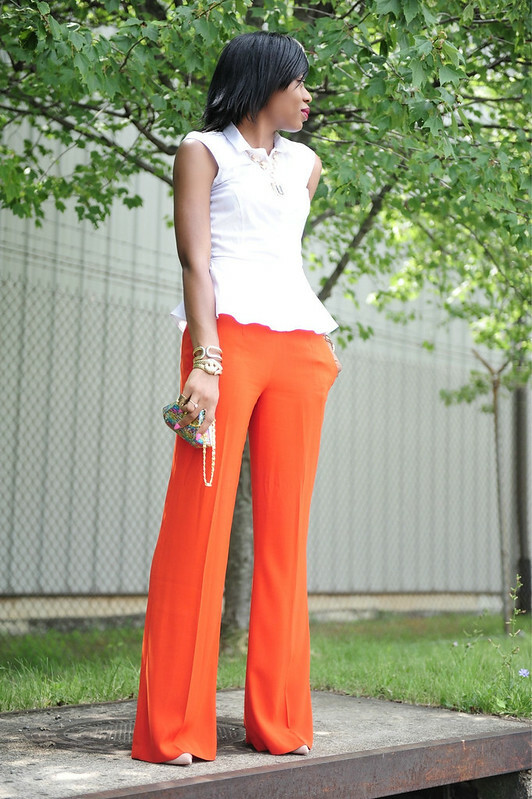 Simply gorgeous...those pants are fierce! I really like those pants!! !Beautiful picture and beautiful blog. OMG! You look great & pretty in orange!!! and I'm super jealous of your heels!! SUPER CUTE!!! I'm planing to get the classic black one next month! I love it all! I've been following you for quite sometime now and I don't think you've ever posted an outfit that I didn't love. Gosh you look so lovely!